Every patient with diabetes will in future receive regular check-ups to stop them from developing serious complications. Ministers have also announced plans to stamp out variations in the quality of care patients with the condition receive. The proposals are outlined in the National Service Framework for Diabetes published on Thursday. The long-awaited document aims to improve diabetes care on the NHS across England. The main focus of the NSF is to prevent people from developing serious complications. Thousands of people across England lose their sight every year or are forced to have limbs amputated because their condition is not managed properly. From 2006, every person with the disease or at risk of developing diabetes will be offered regular appointments with medical staff to try to stop this from happening. From 2007, they will be able to have regular eye tests at a local GP clinic to check their sight. Ministers say this policy will help to save the sight of at least 1,000 people each year. The government will also appoint a new National Clinical Director for Diabetes who will be responsible for ensuring high standards of care across the NHS. This is the second part of the NSF. The first part, published in 2001, included pledges to improve care particularly for children and young people with the condition. Diabetes is a hormone disorder, which comes in two types. Type 1 destroys the cells in the pancreas that produce the hormone insulin, which sufferers then need to replace to control their blood sugars. Type 2, or non-insulin dependent diabetes is the most common form of the disease, usually occurring in people who are over the age of 45 and overweight. Sufferers either do not make enough insulin, or are unable to make proper use of it, leading to a build-up of sugar in the cells which causes health problems. Around 1.3m people in England are affected by the condition which, if not properly treated, can lead to complications such as heart disease, kidney disease, blindness and foot problems that may lead to amputation. Diabetes is estimated to account for 10% of NHS hospital resources. Speaking at the launch of the NSF in central London, Health Secretary Alan Milburn said it would help to boost standards across the health service. "We are determined to improve the quality of care for people with diabetes regardless of where they live or who they are. "Our goal is to make the best practice already offered in some places the norm." 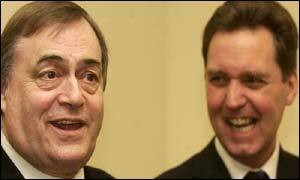 Deputy Prime Minister John Prescott, who has diabetes, also backed the NSF. "This is the NHS at its best - not only looking after people but looking out for them too. Many may not recognise the early or developing signs of diabetes." Sir Liam Donaldson, chief medical officer for England, added: "Diabetes is a serious health challenge for many thousands of people in this country and one that we are determined to support the NHS in tackling." Paul Streets, chief executive of Diabetes UK, said: "We welcome this as a step forward but the biggest challenge is making sure the improvements are consistent and effective across the country." NSFs set out national standards, establish performance milestones and put in place strategies to deal with specific services or conditions. Since 1998, NSFs have been launched for cancer, paediatric intensive care, mental health, coronary heart disease and older people.